For beginning and improving bridge players it is very helpful to have a bridge bidding crib sheet or cheat sheet which you can refer to when you aren’t sure which bid you should make. 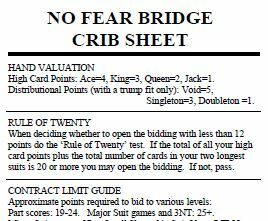 You’ll find a bridge bidding cheat sheet and many other helpful handouts at No Fear Bridge. You can print out the crib sheet and keep it with you if you are playing with friends, playing bridge online or even take it with you to your bridge class if you are attending one. If you are playing online no-one can see if you have your trusty cheat sheet handy and it will help you grow in confidence. Use it if you are playing with other real players and also use it if you are playing with robots to improve your game. If you belong to a local bridge club with a beginner’s group they might allow you to take the crib sheet to their sessions – but do make sure to check first as it would be a shame to upset or offend anyone. Along with the bridge bidding crib sheet you will find many other helpful handouts to help improve your bidding, including a glossary of bridge jargon and a handout telling you some of the exceptions to the rules of bridge. After all, most good rules have an exception! What Is A Bridge Player Called? Is Bridge Hard To Learn?